Welcome to the revised edition of the "My Kid's Allergic to Everything" Cookbook! 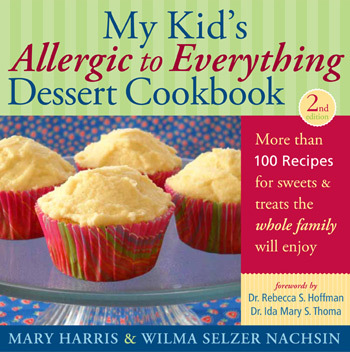 This cookbook is designed for parents and caregivers who are coping with food allergies in their youngsters. Perhaps you suspect, or your doctor has just told you, that your child is allergic to certain foods. You want to be able to feed your child nutritious and healthy snacks which do not contain the foods he or she is allergic to. You want your child to be a normal part of the crowd, and to not feel singled out by what he or she eats. We have created cake, pie, cookie and dessert recipes for you to use on special occasions or just for fun. With our children's diet limitations, fun can be hard to find in the kitchen, and we believe childhood should be fun, not just healthy! Read more about the book, or try some recipes! © Mary Harris and Wilma Nachsin. Web site by interbridge.